I had the pleasure of reading Lauren Boyd’s debut contemporary romance Baking Love and I have to say, I was quite impressed. The book did not read like a debut author’s work. It was extremely well written, had excellent pacing, and an engaging story line. Lauren did an excellent job of developing her characters. They had depth and I connected with them, especially Kate. I could feel her conflict as she dealt with her feelings for Eric. She was a strong character and kind of snarky, which I loved. Her internal dialogue was sometimes funny and I laughed out loud at her thoughts a few times. 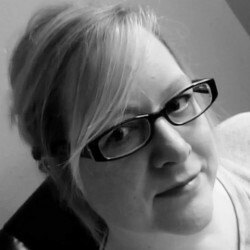 In addition to developing strong, relatable characters, Lauren found plenty of situations to stick them in, creating enough conflict to keep the pacing of the book at a good rate. There were no slow spots where I found my attention wandering. My focus stayed firmly on the story. There was a scene I especially liked. It put Kate in a very uncomfortable position, which is the best position to put characters because it keeps readers entertained, and it kept me reading and giggling. I don’t want to spoil anything so I’ll just say pretend brides can be funny…and a little bittersweet, too. I will admit I was a little worried going into the story. 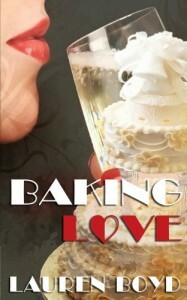 Kate, the main character, is hired to bake a wedding cake for the man she’s in love with and the woman he’s marrying. I didn’t know how I’d feel if in the end of the book the man, Eric, were to leave his fiancée for Kate. But I was pleasantly surprised by the ending of the book. I thought it was perfect. Everything wrapped up exactly how it should and left me with a smile on my face and a sense of contentment. Bottom line: Lauren Boyd baked herself a good one with Baking Love. She is definitely an author I’ll be watching. I won’t hesitate to read another book of hers and I highly recommend Baking Love to anyone who loves sweet contemporary romance.